The inaugural meeting of a South Korea-US working group aimed at better coordinating their North Korea policy was set to be held in Washington on Tuesday afternoon (EST), according to Seoul’s Foreign Ministry. 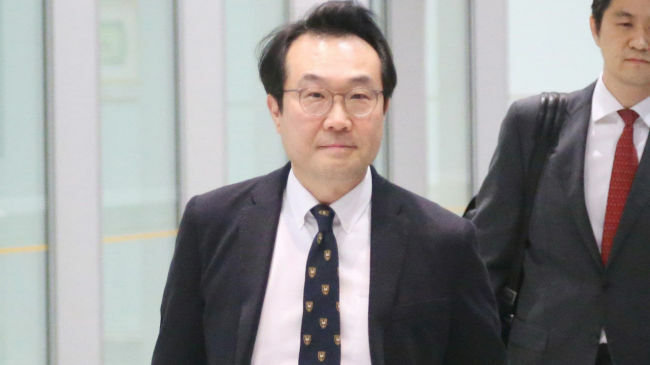 Lee Do-hoon, South Korea’s special representative for Korean Peninsula peace and security affairs, was expected to discuss the prospect of a high-level meeting between North Korea and the US, and sanctions exemptions for an inter-Korean railway project, during the meeting with his US counterpart Stephen Biegun. Headed by Lee and Biegun, the working group comprises officials from each country’s presidential office and ministries handling foreign affairs and inter-Korean issues. Members of the team could be changed flexibly according to agenda items, said Lee. “It will systematize the consultations we’ve been having, and expand their scope beyond the Foreign Ministry,” Lee told reporters on Monday during his three-day visit to Washington. The working group aims to boost coordination on denuclearization efforts, implementation of sanctions on the reclusive country and inter-Korean cooperation, amid speculations of discord between the countries over the pace of inter-Korean developments. A key issue to be discussed at Tuesday’s meeting was to be South Korea’s plan to conduct an inspection of cross-border railroads with North Korea, and to hold a groundbreaking ceremony this year for the project to connect the railways across the border. The US-led United Nations Command, which has authorized passage through the Military Demarcation Line, did not approve Seoul’s plan to test run a train across the border. It was seen as a sign of the US’ objection to the project that could undermine international sanctions on the North. South Korea has sought to expand cross-border exchanges with the North, which it believes will facilitate denuclearization, while the US maintains inter-Korean progress should come in tandem with progress on North Korea’s denuclearization. Lee and Biegun met on Monday and finalized the plan for the operation of the allies’ working group, which they agreed to create during Biegun’s visit to Seoul last month. Lee is in Washington through Wednesday.